Straight-up cauliflower rice does not appeal to me. I love using veggies for grains when possible (even in more unusual dishes like Squash Breakfast Porridge and Bread-Free Stuffing). But I prefer my cauliflower rice heavily doctored, to make it satisfying and flavorful. 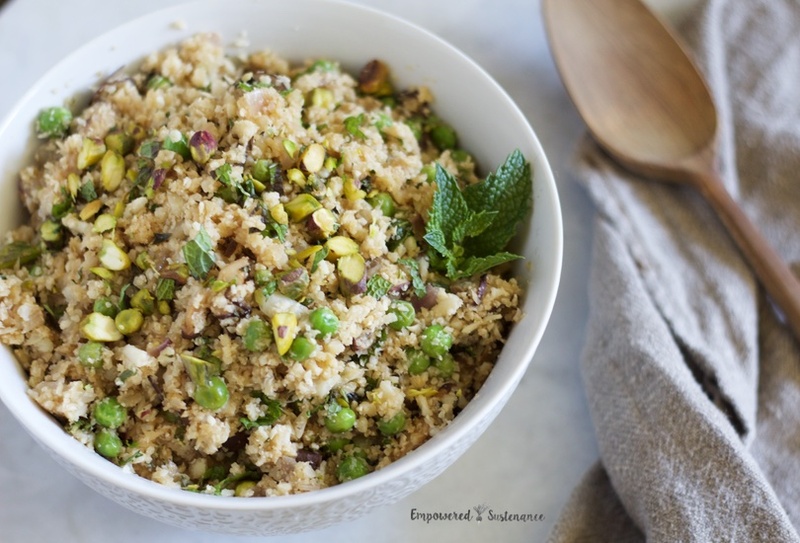 This recipe uses rich, umami flavors, bright herbs, sweet peas, and crunchy pistachios to make a beautiful cauliflower pilaf. Frozen peas add their natural sweetness and bright color to the dish. I always have a bag of frozen peas in the freezer for this dish… or as an instant ice-pack. Tamari sauce or coconut aminos add the depth and saltiness associated with soy sauce. Coconut aminos are slightly sweeter and less salty, so that’s why the recipe calls different amounts depending on which option you choose. Pistachios or cashews add needed crunch to the dish. You can substitute any toasted nut or seed. I’ve also topped this dish with tamari-roasted sunflower seeds sold at my health food store… that is phenomenal. Enjoy a vibrant, fresh pilaf without rice. This cauliflower pilaf is studded with sweet, tender peas and the umami flavors of mushrooms and tamari sauce. Heat the oil in a saute pan over medium heat. Add the shallots and mushrooms. Cook, stirring occasionally, for a few minutes until tender. Add the garlic and cook briefly. Add the cauliflower rice and stir to coat with oil. Cook time will depend on the size of the cauliflower crumbles, so cook until it has a tender but firm texture. Toss in the tamari (or aminos), vinegar, peas, salt, and pepper. The peas will take just about a minute to warm through. Then add in the mint and lemon juice. Top with chopped nuts, if desired, and enjoy. I don’t like cauliflower rice, because to me, the whole point of using rice is its absorbancy factor, not its visual appearance. Placed beneath or stirred into any *wet* meal, cooked rice absorbs liquids that might otherwise be lost or wasted. And, since cooking mixed foodstuffs often results in diluted water-soluble vitamins and other nutrients, losing or optionally discarding such *run off* is definitely not wise, nor even desirable most times. 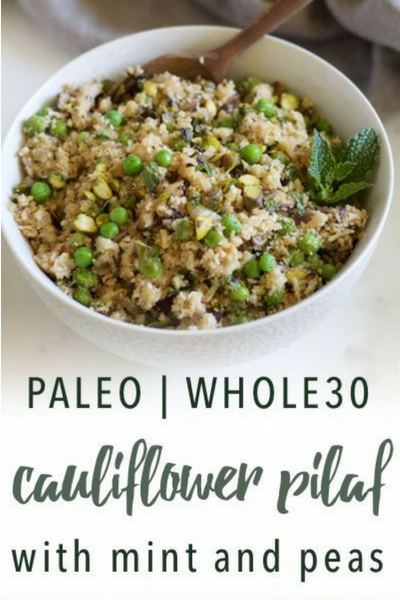 Being primarily vegetarian with a paleo bent (which, btw, *Pegan* does NOT address), I’ve found the cauli rice bandwagon limited and frankly, dishonest. Regardless of how versatile a vegetable cauliflower is, the way it is prepped, dressed or *doctored* NEVER approximates actual cooked rice. You do not have to post this….